SAG is the amount the shock compresses under your own body weight. Make sure you check your SAG with all your riding gear on (riding shoes, hydration pack, etc). The ideal amount of SAG is best determined by your bike manufacturer, there are many linkage designs & each design works best according their design. 1. 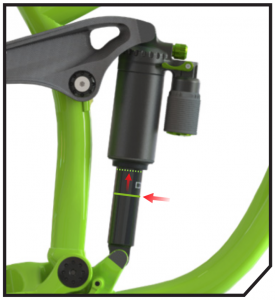 Start by inflating the shock to your recommend pressure from the base settings chart in the tab above. 2. Move the O-ring to the top of the shaft. Mount the bike in your riding gear and in the attack position. 3. Measure the distance the O-ring has moved. Your SAG equals the distance from the O-ring to the air canister. SAG = The distance from the air canister to the O-Ring.